The Key Knife from SOG is a 1.5 inch stainless steel blade built-in to a steel(brass colored) key that looks like all the others on your keyring. The clip point blade is made of 5Cr13MoV Stainless Steel - Rc. 55-57. 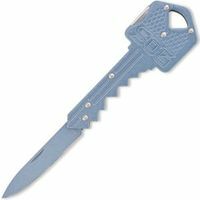 This knife/key is hidden and discreet until you need a sharp blade to do some chores or get you out of trouble. It utilizes a lockback locking system to remain open and safe when you are using it. The entire unit is 2.5 inches long. We have a saying that the best knife is the one that you have with you! Always be prepared with the new SOG Key knife. This is the first lockback of its kind. Open up your awareness. We love the fact that sometimes we wish we had a knife to clean our fingernails, cut a rope, open a box, sever a thread. Now we do�. always. Our new key knife just might save the day.